We’re so excited to have Meta of One More Mushroom on Small Fry today to share her knowledge and tips about interior design for kids. Meta has the most incredible style and we can’t help but drool every time she shows glimpses of her home on her blog or Instagram. 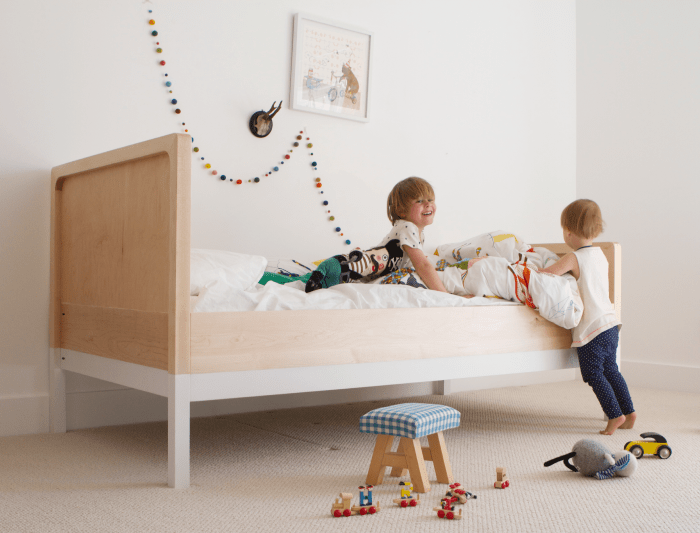 She recently designed the awesome “Henrik” bed you see in these photos, which is now for sale here! 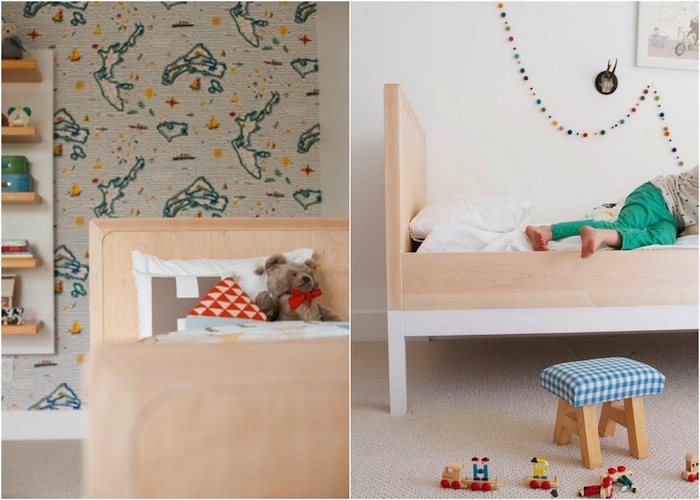 Designing for children’s spaces can be tricky, we’re excited to share her know-how with you! “I am an interior designer and a budding children’s furniture designer. I really enjoy decorating for children, they are so creative, fun and carefree. I love expressing their personalities through their spaces. 1. Pick furniture they can grow into. When decorating children’s spaces I like to pick furniture that is fun but with a modern clean design. For example, The Henrik Bed was designed with the idea that it could be in any bedroom in the house and that hopefully Henrik will want to take it with him when he goes away to college. 2. Keep the walls neutral. I usually keep the walls white (sometimes gray). A room can be too busy and dark if you add color on the walls. White walls reflect so much light on dark dreary days. Add color and pattern in the accessories and toys. 3. Don’t worry about having everything match. Pick items that you love and make it work in your space. If everything matches, side table, bed, etc. it looks like it’s from a catalog and not like someone actually lives in the space. You want the space to feel loved and lived in. 4. Use the child’s interests when thinking of the design. For example, in my son Henrik’s room he loves pirates, ships and exploring. So I wallpapered one wall in his room with the Ralph Lauren Out to Sea wallpaper. It makes him feel like he had a say in the design and that is important and a fun way to show him his opinion matters. Thanks Meta! Isn’t that bed gorgeous? She’s offering 10% off to readers here. Photography by Meta Coleman & Ashley Thalman.